11 October 1956: At 3:27 p.m., local time, (05:57 GMT) a Mk.1 Atom Bomb, code-named Blue Danube, detonated at approximately 490 feet (150 meters) over the Kite Site on the Maralinga Test Range, South Australia. 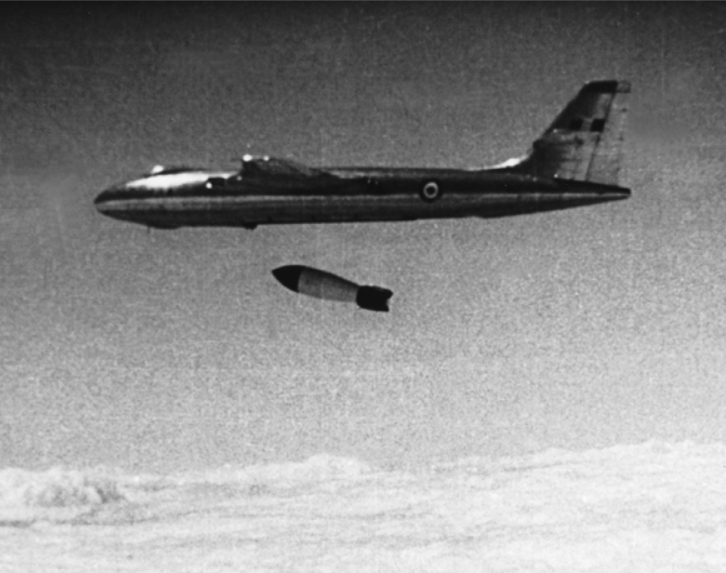 The bomb had been dropped from a Royal Air Force Vickers Valiant B.1 bomber, WZ366, flying at 30,000 feet (9,144 meters). The aircraft commander was Squadron Leader E.J.G. (“Ted”) Flavell, RAF. The Kite air burst was the third detonation of Operation Buffalo, but this was the first British atomic bomb which had been dropped from an airplane. 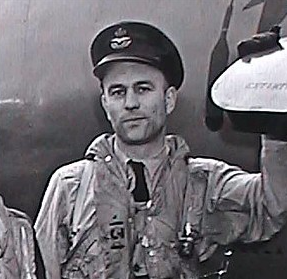 For their performance during this test, Squadron Leader Ted Flavell and bomb aimer Flight Lieutenant Eric Stacey were awarded the Air Force Cross. Blue Danube was an implosion-type fission bomb using plutonium and uranium as fuel. 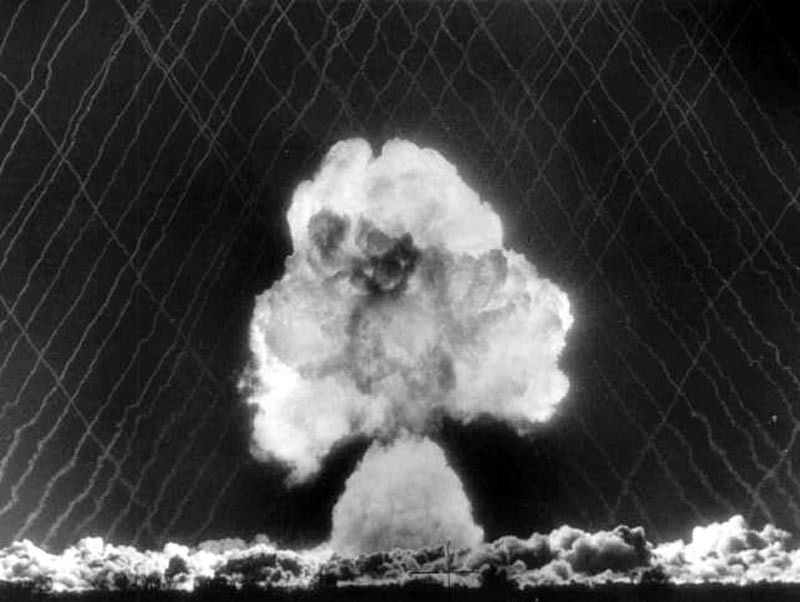 Designed as a 40-kiloton weapon, for this test, the yield was reduced to 3 kilotons. The bomb was 24 feet, 2 inches (7.366 meters) long and had a diameter of 5 feet, 2 inches (1.575 meters). The spherical 32-lens plutonium/uranium implosion system was 5 feet (1.524 meters) in diameter. The bomb weighed 10,000 pounds (4,536 kilograms). Four retractable guide fins would extend to span 9 feet, 0.8 inches (2.764 meters) after leaving the aircraft’s bomb bay. 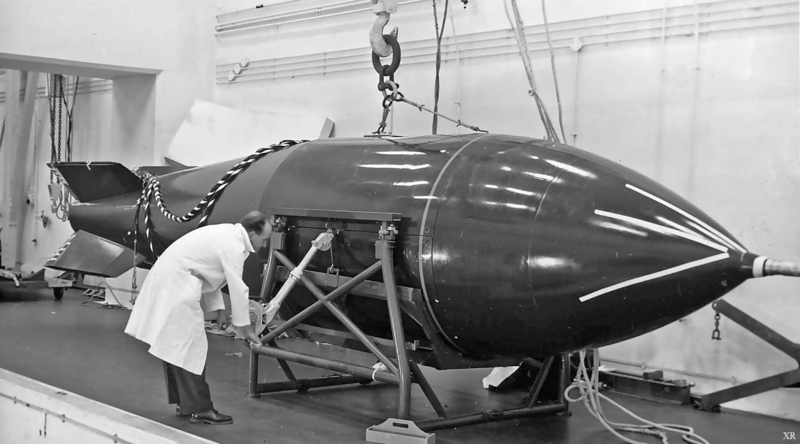 The length of the bomb casing (more than twice that of a similar type U.S. weapon) and the large guide fins made the Blue Danube very aerodynamically stable. Twenty Blue Danube Mark 1 bombs were produced and were in service until 1962. The Vickers-Armstrong Valiant B.1 was designed and built under the direction of Vickers’ chief designer, George R. Edwards. It was a high-wing, four-engine turbojet-powered strategic bomber, operated by a flight crew of five. The leading edges of the wings featured a compound sweep with the inner one-third swept to 37° and the outer two-thirds swept to 21°. It was 108 feet, 3 inches (32.995 meters) long with a wingspan of 114 feet, 4 inches (34.849 meters) and overall height of 32 feet, 2 inches (9.804 meters). Its empty weight was 75,581 pounds (34,283 kilograms) and Maximum Takeoff weight was 140,000 pounds (63,503 kilograms). The bomber was powered by four Rolls-Royce Avon RA.28 Mk.204 or Mk.205 turbojet engines placed inside the wings adjacent to the fuselage. The RA.28 was a single-shaft axial-flow engine with a 15-stage compressor and 2 stage turbine. They produced 10,050 pounds of thrust (44.705 kilonewtons). The RA.28 Mk.204 was 10 feet, 3.0 inches (3.124 meters) long and 3 feet, 11.5 inches (1.054 meters) in diameter. The Valiant B.1 had a maximum speed of 567 miles per hour (912.5 kilometers per hour) at 30,000 feet (9,144 meters). Its service ceiling was 54,000 feet (16,459 meters) and range with external fuel tanks was 4,500 miles (7,242 kilometers). After 1962 the Valiant B.1 was used as a low-level tactical bomber. This resulted in the wing spar suffering from stress-induced fatigue cracks. A replacement spar was developed but due to the cost, the Valiant bomber fleet was quickly retired. WZ366 was one of the first thirty-four Type 706 full-production Valiant B.1 bombers. It made its first flight 18 August 1955 and was delivered to the RAF on 7 October 1955, assigned to No. 49 Squadron. It was one of three Valiant B.1s of No. 1321 Flight, RAF Wittering, selected for use in the Operation Buffalo nuclear weapons tests. Later it served with No. 7 and No. 49 Squadrons, but was withdrawn from service 6 March 1964. WZ366 was sold for scrap 16 June 1965. Squadron Leader Edwin James George (“Ted”) Flavell, A.F.C., Royal Air Force, was born at Battersea, England, 25 April 1922. He entered the Royal Air Force as an aircraft mechanic in 1938, then underwent pilot training in Canada. During World War II, he flew many secret missions over Europe and Scandinavia, inserting agents and dropping supplies in occupied territories. Ted Flavell also flew airplanes which were towing glider transports for the D-Day invasion and Operation Market Garden. 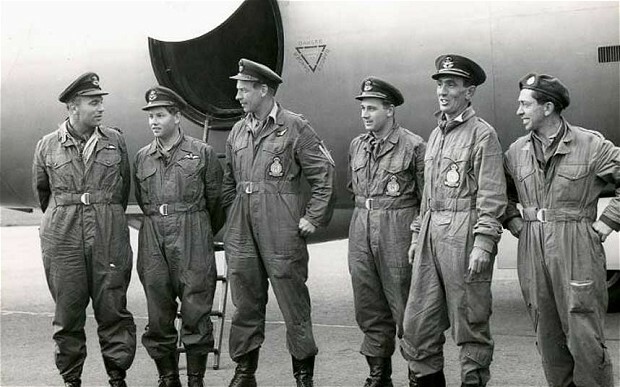 After the war, he flew English Electric Canberra bombers and was in the first group of pilots trained for the Vickers Valiant. Squadron Leader Flavell served in the Royal Air Force for thirty years, retiring in 1968. He died 24 February 2014 at the age of 91 years.